Herbert George Wells (1866–1946) was an English writer and social critic. He wrote numerous books on various topics and in various genres, but he is best known today for his science fiction. Together with Jules Verne, he is regarded as one of the fathers of the field. The Time Machine was Wells’ first major success. 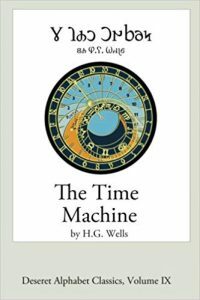 It is the first successful work portraying time travel via a scientific device and introduced the term “time machine.” Suffused with Wells’ socialist perspective, it is both a sharp criticism of the English class system and an riviting adventure set in the declining years of the human race. This edition is in the Deseret Alphabet, a phonetic alphabet for English developed by the University of Deseret in the 1850s and 1860s. 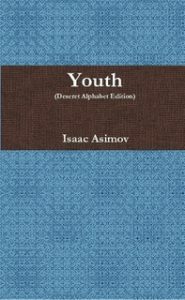 “Youth” is a 1952 novelette by the late Isaac Asimov, and the one story of his to have entered the public domain. It is here presented for the first time in the Deseret Alphabet, a phonetic alphabet for the writing of English. The “Bab” Ballads are a collection of light verse by Sir William S. Gilbert (1836–1911). In writing the Ballads, Gilbert developed his unique “topsy-turvy” style, where the humor was derived by setting up a ridiculous premise and working out its logical consequences, however absurd. 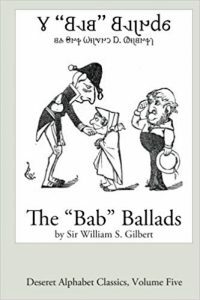 The Ballads also reveal Gilbert’s cynical and satirical approach to humour. 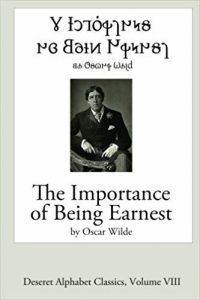 They became famous on their own, as well as being a source for plot elements, characters, and songs that Gilbert would recycle in the Gilbert and Sullivan operas. This edition is in the Deseret Alphabet. 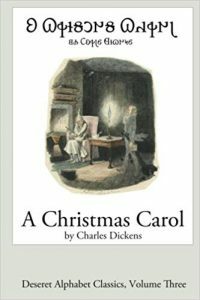 A Deseret Alphabet edition of Charles Dickens’ classic Christmas story. Fifteen stories from the American Master of gothic horror: “MS. 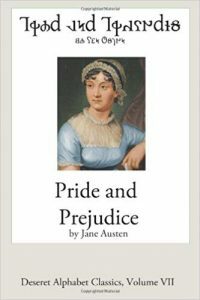 Found in a Bottle,” “Berenice,” “Morella,” “King Pest,” “Ligeia,” “How to Write a Blackwood Article,” “The Predicament,” “The Fall of the House of Usher,” “The Masque of the Red Death,” “The Pit and the Pendulum,” “The Tell-tale Heart,” “The Black Cat,” “The Facts in the Case of M. Valdemar,” “The Raven,” “The Cask of Amontillado.” The stories range from the horrifying to the humorous, but all are written with Edgar Allan Poe’s characteristic expressive style, and all are focused on the twin themes of death and decay. 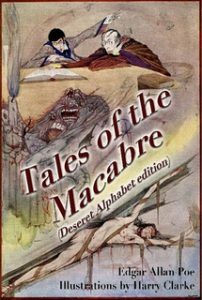 All are among the very greatest of tales of the macabre. 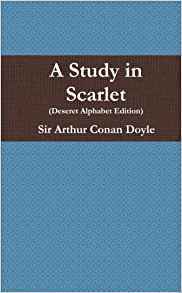 This, The First Sherlock Holmes Novel, Includes A Long Section Giving The Background For The Crime Being Investigated-A Lurid Tale Of Murder And Forced Marriage Inspired By The Anti-Mormon Literature Common In Victorian Britain. 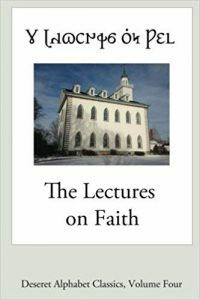 As A Back-Handed Recognition Of This Connection To Mormonism, This Edition Is In The Deseret Alphabet, A Phonetic Alphabet For English Developed In The Utah Portrayed In The Book. This Is The First Full-Length Novel Published In The Deseret Alphabet And The First Book Published In The Deseret Alphabet Since The 1860’s.